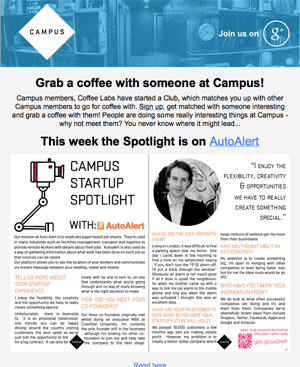 AutoAlert features in Google Campus Spotlight newsletter, July 2014. AutoAlert’s Director, Richard Harris was recently featured in an article for Google Campus Spotlight. An email newsletter which Google Campus sends out to thousands of companies of various shapes and sizes who use Google Campus as a place to work, a place to meet and a place to learn. Richard discussed the history behind AutoAlert, how we started with an innovative way to connect your car to your mobile telephone and get alerts if your car alarm is activated. And how we went from these humble beginnings to a company offering simple yet powerful GPS Tracking software to over 18,000 haulage, transport and logistics and security companies. Richard also talked about the latest iteration of AutoAlert’s award-winning software – Job Management and Instant messaging which helps companies improve their own business, cut paperwork and better manage their jobs through our Jobs. Find out more about our simple solutions and how they can benefit your business. AutoAlert submitted an application for the EIR ICT Labs Challenge. Following is the detail of our application. Millions of paper jobs sheets are produced each day. They are inefficient, involve a lot of manual intervention, often lead to duplication and ensure no one knows what’s going on with their job until the job sheet is returned. Its our mission to eradicate paper based job sheets! Job sheets, works orders, delivery notes or their equivalent are used for millions of jobs each day in multiple different industries ranging from electricians and plumbers to haulage contractors. They are paper based, inefficient requiring lots of manual intervention and duplication and lead to a lot of extra cost. As no one knows the status of the job until the job sheet is returned, this leads to chasing of staff, anxiety and late invoices as your invoices can’t be raised until the details of the work done is returned. Our aim is to eradicate the job sheet and replace it with a cloud based, connected platform where customers and subcontractors can connect to each other, send and receive jobs and update those jobs in real-time as they happen on a mobile telephone. Instant messaging and GPS tracking further enhances transparency, they allow you to see where your customers and engineers are and easily communicate via your desktop, mobile telephone or tablet. Our platform uses cloud, web and mobile phone technologies. We are primarily targeting service based companies with remote workers i.e., electricians, plumbers, construction companies, facilities managers or transport companies. Our job scheduling solution is especially useful to companies who are big enough that they have large customers, may use subcontractors and have ambitions to grow further, but who are not so big that they can afford to invest a lot of time and money into more complex and bespoke systems. The electricians market alone comprises of about 30,000 companies in the UK producing an average of 30,000,000 jobs per year. The plumbing market is of a similar size. Competitors include Primavera, SAP and Oracle. However, these systems are typically complex and expensive and out of the reach of most smaller businesses. Newer incumbents to the market include vWorkApp and Geop. 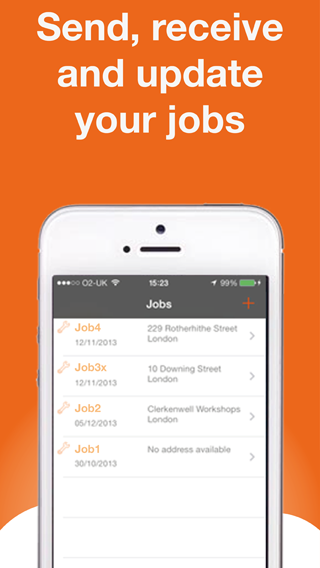 They utilise smart phones to provide job information and tracking. They are typically easier to use and available for much smaller companies. However, what differentiates AutoAlert from the competition is the networked aspect of our system. Unlike our competitors, our platform allows our customers to connect to their own customers and suppliers. This means that customers don’t need to pay for different systems and then log in and out of each while working for different companies. With AutoAlert you can receive and update jobs from your customer as well as send your own jobs to your subcontractors. Although there are no legal obligations to AutoAlert in particular, our customers have a duty of care over their own employees and it is therefore important that our applications are simple to use with information that is easy to see and with buttons that are easy to press, This helps reduce distractions and ensures our users can concentrate on their other tasks. Many of our customers have employees that drive and this is therefore also something we need to consider. We are currently developing our software to determine when our a phone is being used by someone who is driving and only show messages with a minimum of text, large fonts and requiring no interaction from the driver. Other more detailed job information will only be available once the vehicle has stopped. Free – this allows you to sign up to the platform, connect to your customers and suppliers, receive and update jobs and use instant communication between your contacts. 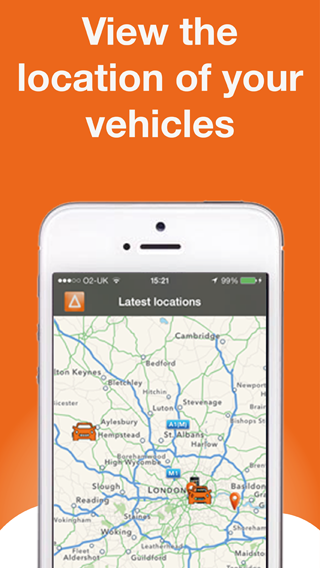 Advanced – allowing you to monitor your vehicles or engineers using a GPS tracking device. Find out more about AutoAlert’s innovative software and how it can benefit you. If you haven’t already downloaded the application, you can get it from the iTunes store. What is AutoAlert Monitor anyway? AutoAlert Monitor is a simple application for the iPhone and iPad which provides all the benefits of AutoAlert but in the palm of your hand. AutoAlert provides transparency over your business. Download the iOS Monitor application from the Apple iTunes store. With the iPhone and iPad, there are a whole host of new ways to interact with your mobile phone and make entering jobs, viewing your vehicles or communicating with your colleagues easier. Following are just some of the new ways you can interact with our iOS Monitor application. Rotating your fingers on the screen rotates the map. Slide two fingers up on the radar screen to change the angle at which you can view your vehicles on the map. This provides for a more 3D view and when zoomed in can show your vehicles among buildings. When you’re zoomed in, then pinching or expanding two fingers on the map causes it to zoom or out. Double click on the map to zoom in. When you’re in the radar screen on the iPhone, pressing and holding on the map will cause the map type options to appear. The options are displayed for a few seconds and allow you to easily switch between standard map view, hybrid or satellite view. Particular useful if you want to see a photo quality image of where your vehicle is parked. Sliding in from the left on the orange tab on the radar screen shows you a list of all your vehicles. You can then click on each one to find it on the map, then zoom in or out. You can also refresh the map, and get further information and settings. Sliding back from right to left closes the list. You can also slide in from the left on other screens such as the jobs screen and messaging screen to bring back the previous screen. The European Business Awards is looking for innovative business models that can be exported and used as a reference by other companies. At AutoAlert, our approach to job management is simplicity and innovation. We’re helping our customers reduce duplication, reduce administration and improve clarity over their business by eradicating paper based job sheets and delivery notes and replacing them with our simple, mobile phone and web based job management system. We’re learnt from other leading companies such as Dropbox and Twitter and we believe that what we’re doing can be used as a reference for other companies as well. The following highlights why we believe our approach to job management is innovative and disruptive to the existing status quo. AutoAlert provides a social networked platform which enables companies to connect to their customers and suppliers, manage their jobs and share the status of those jobs and invoices with everyone involved. With AutoAlert you can also monitor your vehicles and communicate with your staff and suppliers from your desktop, tablet or mobile telephone. AutoAlert aims to reduce the paper based job sheets which are used in the many industries which use remote workers. This includes electricians and plumbers, facilities managers and transport and logistics companies. In the UK alone there are over 900,000 field trade companies and around 14 million in Europe and North America. Paper based job sheets are used in these industries to send information about each job to the final engineer and to get information back about what was done on the job in order that invoices can be raised. This process is laborious, involves lots of duplication, especially as more subcontractors are involved in each job and is opaque with no one knowing what is happening with the job until the job sheet is returned. We’ve improved security, server management and performance which is especially opportune given the recent publicity surrounding the heartbleed virus. We’re developing our online media campaign. We continue to make improvements to our on-boarding process ensuring our software is easy to understand and easy to use. AutoAlert has been present at industry events and are networking with other companies and potential customers. We now have over 18,000 customers using the system. 5,000 jobs have been processed and over a million pounds worth of invoices have been raised by our customers. 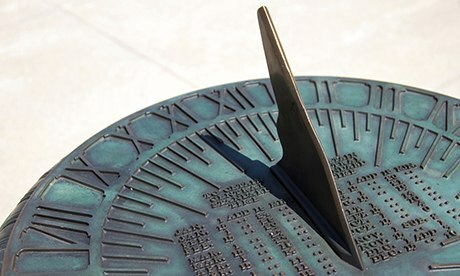 In the past, job scheduling was the preserve of large companies using complex systems from the likes of SAP and Oracle. With the advent of smartphones, new companies such as GeoOp and vWorkApp have entered the market offering more simple job management applications using mobile telephones. This has opened up the technology to smaller customers who are lacking the skills and resources which are available to their larger competitors. 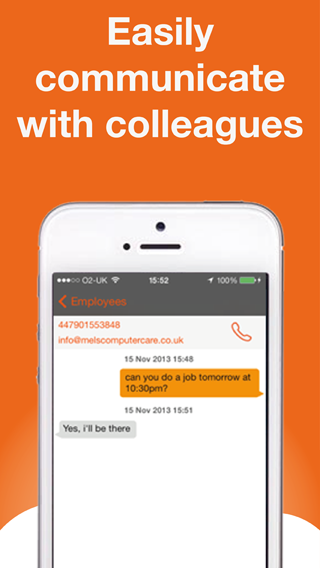 AutoAlert offers a simple, mobile phone based job management system. However, where it is different, is in the connected nature of the system. Other applications work well for individual companies but fall down when companies get jobs from their customers, or when they pass jobs on to their own subcontractors. Large companies are also let down as they cannot force their subcontractors to buy into the same systems they use. Consequently, they do not have visibility over the status of the jobs done by their subcontractors. With AutoAlert, each company can connect to their own customers and subcontractors. Everyone’s aware of the status of their jobs as they’re updated by the engineer on-site. There’s no chasing people to find out what is happening, and information is more readily available meaning queries can be escalated immediately rather than weeks later when the information may have been forgotten. With AutoAlert you can also raise your invoice as soon as the job is complete and see whether your customer has viewed and paid your invoice in real time. The connected nature of our system creates massive value for our customers. It also creates value for us as our customers become our salesforce due to the massive value inherent on inviting their own customers and suppliers to connect. We’ve developed a “blue collar social network” allowing companies to connect to each other, send and receive jobs, then monitor and share the job status as they’re updated in the field by the engineer on their mobile phone. Unlike existing paper based processes which are labour intensive, involve duplication, especially as more subcontractors are involved in the job and is opaque (no one knows what’s happening until the job sheet is returned), AutoAlert provides clarity over what is happening as it happens, thereby reducing anxiety, reducing time spent chasing employees and increasing time available for other tasks. The development of our job management platform has been achieved through close collaboration with our customers. Initial inspiration was provided by our customers who liked our simple to use vehicle tracking solution and realised that we could do something similar to reduce the cost of managing their jobs. We have worked closely with our customers and have built a culture with them where they can feel open to come to us with comments and suggestions. This culture was created over a long term through periodic communication with our customers and by us being open and available. Even where a customer has telephoned us with a problem, we have thoroughly investigated it, kept them informed of what we are doing and then made changes as quickly as possible. This openness is the key message we’ve always tried to portray to our customers. We have also used technology such as instant messaging from within the AutoAlert system to make it easier for our customers to ask questions and provide their suggestions, and for us to respond back in a clear and timely manner. We also periodically sit down with our customers to see how they use AutoAlert. This provides further insights and ideas for improvements which may not be evident in just a conversation or email from our customers. We’ve learnt from this and used similar ideas within our own product development. This ultimately led to the innovative and connected nature of our platform which differentiates us compared to the more standard “single company” approach that our competitors have followed. We believe we are innovative and remarkable due to the lessons we’ve learnt and the unique way in which we’ve structured our business and product in order to positively disruptive how many small business currently run their day to day operations using inefficient and opaque processes based around paper based job sheets. By reducing our customers stress and anxiety and by providing them with the tools to grow and develop their business we believe we can make a massive change to the many industries who used remote workforces and we believe we can achieve so much even with such a small team. Find out more about AutoAlert’s job management software, and how it can benefit your business. We meet lots of interesting and ambitious companies in our travels. Many want to grow their companies and build a national presence. Unfortunately, many of the business owners we speak to find they don’t have enough time in the day to manage their existing jobs, never mind expand, take on new customers and subcontractors and build their business. So what do you do if you’re ambitious, keen to grow your business but not sure why you never have enough time in the day? We believe that job scheduling software can help. By focusing on the exceptions rather than every job, you can free up your time to grow your business. AutoAlert Job scheduling puts the information at your fingertips when you need it, rather than having to chase your staff. This reduces stress, lets your staff get on with their work without interuption and means you can answer calls from customers at the time rather than trying to find out the status of the job then having to ring your customer back later. With AutoAlert Job Scheduling, your engineer can update the job in the field. As soon as they update the job you can see the job’s status back in the office. As information is entered at the time then there is less chance of information being forgotten or lost. Any discrepancy can also be investigated while still fresh in peoples minds. You can also raise an invoice as soon as the job is complete with the information automatically uploaded from the electronic job sheet. You can see that your customer has received the invoice and send notifications if payment has not been received. This means less chasing, less disputes over invoices and quicker payment! We’ve also picked up some other tips and suggestions for busy entrepreneurs along the way. Here’s our top three along with links to some other interesting articles. Better time management and especially knowing when to say no! Find out more about how AutoAlert job scheduling and tracking software can help benefit your business. We continue to work hard on AutoAlert’s desktop. Our software updates ensure you can easily see your vehicles, schedule your jobs and communicate with your employees, customers and subcontractors. Below is a list of all the updates we have introduced. Keep a check of this page for new developments and please add your own suggestions as to what we can do to make our software even better. For a real time update of changes and improvements, check out our autoalert support twitter feed at #autoalert_support. Changes to the tracks report – made more intuitive. Can now select the time and show all the routes between that date and time. Added distance for the portable units.